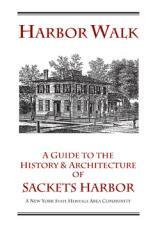 Sackets Harbor, N.Y. - With sponsorship from Watertown Savings Bank, the Sackets Harbor Historical Society has published an updated edition of its Harbor Walk: A Guide to the History & Architecture of Sackets Harbor, NY. The book is available from the Sackets Harbor Historical Society and at several venues in the village that was a shipbuilding center during the War of 1812. The 44-page illustrated guide celebrates the historic architecture as seen at homes, businesses and buildings in the waterfront village, at Madison Barracks, and on a 17-point Town of Hounsfield Driving Tour in western Jefferson County, NY. Sackets Harbor Historical Society President Jan Maas says, "This guidebook interprets more than 200 years of our cultural, economic and military history by showcasing the architectural quality of our built environment and serves the Historical Society mission to educate the public about the unique heritage of our community." The book&apos;s front cover features the Sackets Harbor Bank Building at the corner of West Main and Broad Streets. Watertown Savings Bank operates a branch in the building that dates to c.1836 and includes the Sackets Harbor Historical Society. The Sackets Harbor Bank housed here in 1836 was the county&apos;s second bank. The book&apos;s back cover highlights the Union Hotel, at West Main and Ray Streets, now owned by the New York State Office of Parks, Recreation and Historic Preservation and housing the Great Lakes Seaway Trail Discovery Center. Frederick White, reputedly the wealthiest man in Jefferson County, built the hotel in 1817-18 to take advantage of the post-War of 1812 hotel trade. The guidebook notes that the building&apos;s "well-preserved interiors are counted among the finest of any Federal-era public buildings in New York State." 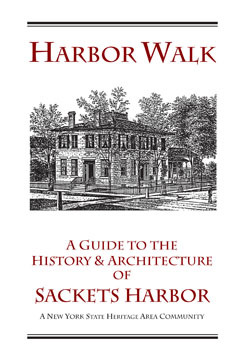 The guide includes a short history of Sackets Harbor, a guide to 13 architectural styles, a glossary of architectural terms, and a bibliography. The original text was prepared by Michael D. Sullivan and updated by Sackets Harbor Historical Society President Jan Maas. Local historians Bob and Jeannie Brennan, Sackets Harbor State Historic Battlefield Manager Connie Barone, the staff at the Pickering-Beach Historical Museum, Flower Memorial Library and Olin Library at Cornell University contributed to the Harbor Walk guide&apos;s development. Sackets Harbor artist Lawrence Barone provided the new cover design and updated several maps. The Northern New York Community Foundation and the Heritage Area Program of the New York State Office of Parks, Recreation and Historic Preservation provided funding for the first edition of the guide. Sackets Harbor is a New York State Heritage Area Community. Sales benefit the Historical Society&apos;s interpretive projects. Call 315-646-1708 for more information. Contact: Jan Maas, Sackets Harbor Historical Society President 315-646-1708, 646-2613 Note: Jan is pronounced "yon."